To cater to the customers’ needs with excellence, we are engaged in offering Two Head Automatic Linear Piston Filling Machine. As a leading Manufacturer, Exporter & Supplier, we offer a premium quality range. The machine is made of top drawer raw material. Its accurate design, durability and high performance make it an irresistible proposition for the customers. For our esteemed customers, we make it available at easy on the pocket rates. 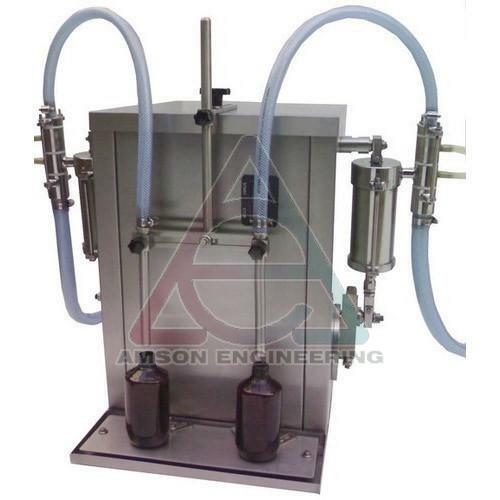 This Automatic Two Head Linear Piston type Filling machine (AEAFC0230) is manufactured only with the purpose of multiplying the output of any filling unit, where the requirement of products is very high. A very reliable machine with low maintenance is the main motto of ours during the design of this machine. The result was a great success and satisfied our customers to the maximum. High efficient machine parts and good technology makes this machine the perfect engine to deliver the best. Any hot or cold liquids/viscous or creamy products can be accurately measured and filled in any shaped containers or bottles with this machine. High output is the result. We are assuring an output of maximum 40 fills per minute with this 2 head machine. Feeding of bottles into the conveyor is done manually and all other operations such as bottle stopping at filling station, Filling of balm accurately and moving the bottles to the outlet side are Automatically done. Machine size - 6 feet L X 3 feet W X 5 feet height . Machine weight - 185 Kgs approx. Conveyor motor - 1/2 Hp Variable speed AC Motor 3 phase. Power Consumption - 3 KwH.Maximum. Fill accuracy - +/- 0.5 %. Output - 40 Fills per minute Maximum as per volume. All material contact parts, Cover, Frame cover are in S.S.304 quality Mat finish. Stainless steel 304 piston barrel type filling - 2 Heads. Bottle stopping for Filling by pneumatic Stoppers - 2 Nos. Panel box at the Bottom of the main assembly with Electrical switches, Pneumatic Solenoid Valves and control units. Separate Operating Panel Board Provided.